The Encyclopedia of World Biography says: Italian journalist Oriana Fallaci became nearly as controversial as the world leaders and dissenting voices she was famous for interrogating during her long and prolific career. . . She often pushed her subjects into making controversial statements. . . In the preface to one of her most accomplished works, Interview with History, she summed up her antagonistic style of journalism, asserting, "I have always looked on disobedience toward the oppressive as the only way to use the miracle of having been born." Oriana Fallaci is currently considered a "single author." If one or more works are by a distinct, homonymous authors, go ahead and split the author. 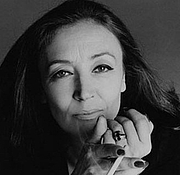 Oriana Fallaci is composed of 16 names. You can examine and separate out names.